In-demand Leander ISD is a little higher than the Metro median, but Austin ISD is $84,000 — 26% — higher at $399,000! ACS data shows metro area median household income at $73,800 in 2017. For discussion’s sake, assume it has increased to $75,000 in 2018. With 10% down and reasonable assumptions about taxes and insurance premiums, the monthly payment at a price of $315,000 would be about $2,445, or about 39% of a median household’s monthly gross income. Generally, the median-priced home in the ten lowest-priced school districts should be affordable for a median-income household with little or no other debt. 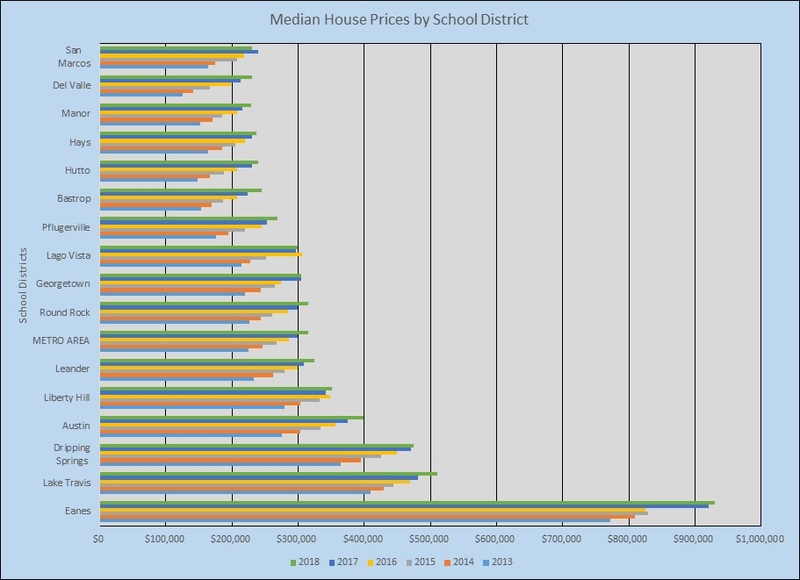 In Austin ISD, however, the median-priced home requires just under $100,000 annual income. Note that the definition of “median” is that 50% of all houses in Austin ISD require more than $100,000 household income. 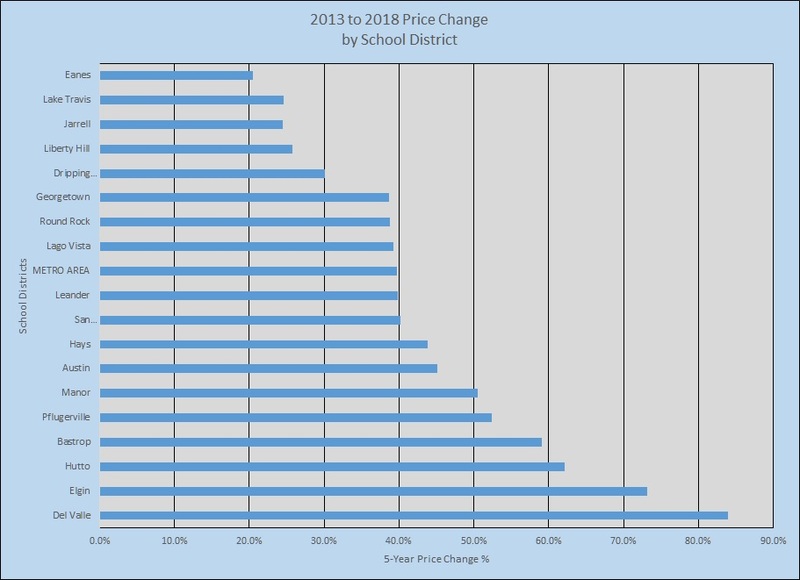 There’s not a perfect correlation, but the lowest-priced school districts are generally experiencing the most dramatic increase in home prices, from just under 40% in Round Rock, Lago Vista, and Leander to almost 85% in Del Valle ISD! Ultimately, where we can afford to live is a function of housing and transportation/commuting costs. As Austinites move farther from the city, their commuting costs generally increase. The combined cost of housing and transportation will ultimately impose a real limit on how much sprawl we can sustain. In the meantime, hollowing out Austin ISD is impacting the region’s largest school district in very detrimental ways. The city of Austin has talked for years about land use policies aimed at creating activity centers around the city where at least some residents can live, work, and play, and which will concentrate enough of our growing population to make a functional transit system at least possible. In addition, Austin voters recently approved $250,000 in bond debt that will be used to address the city’s affordability issues more directly. The issue is a regional one, however. Central Texas remains an attractive place to live and to visit. Let’s do everything we can to keep it that way.